Health-conscious people are haunted by the idea that they “should” correct their body posture, and many fight a chronic, uncertain and tedious battle against crookedness, primarily as self-defense against common problems like neck pain, headaches, and especially low back pain. The characteristic ways that we sit and stand and walk are among the strongest of all habits, with deep roots in personality — and so changing your posture may be just as difficult as quitting smoking or potato chips. It had better be worth the effort! Use a hard chair with a straight back and armrests, placing the spine against the back of the chair. A foot rest reduces fatigue. Always keep one or both knees higher than hips by crossing the legs (alternate sides) or by using a foot rest. If your back flattens when you sit, place a lumbar roll behind your lower back. When sitting at a table, keep the back and neck in good alignment. Do not sit in front-row theater seats so you don’t have to tip your head back. When driving a car, pull the seat forward so the legs are bent when operating the pedals. If your back flattens when you drive, use a lumbar support pillow. Whenever possible, sit while working, but stand occasionally. When standing for long periods of time, keep the lower back flat by propping one foot on a stool or rail, alternate feet occasionally. Avoid tilting the head backward (when shaving or washing your hair). Avoid lying on the abdomen. Always remember when lying on the back, a pillow or lift should be placed under the knees. Also, when lying on your side, keep both knees and the hips bent, avoid using thick pillows. When lifting, avoid bending at the hips. Keep the back straight, bend the knees, and lift with the legs. Assume a side-stride position with the object between the feet to allow you to get low and near the object. When performing a one-hand lift, use the same technique as for two-hand lifting but support the trunk with the non-lifting hand. When lifting, do not twist the spine. This can be more damaging from a sitting position than from a standing position. 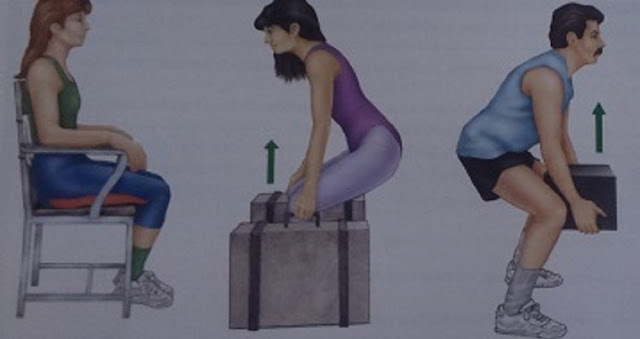 Also, when lifting, keep the object close to the body, do not reach to lift. Tighten the back muscles before lifting. If possible, avoid carrying objects above waist level. But when objects must be carried above the waist, carry them in the mid-line of the body, preferably on the back (use a backpack). Always push or pull heavy objects, rather than lifting them. It takes 34 times more force to lift than to slide an object across the floor. Do not try to lift or carry loads too heavy for you. The most economical load for the average adult is about 35 percent of the body weight. Obviously, with strength training, one can lift greater loads, but heavy loads are a backache risk factor. Divide the load if possible, carrying half in each hand/arm. If the load cannot be divided, alternate it from one side of the body to the other. When lifting, and lowering an object from overhead, avoid hyper-extending the neck and the back. Any lift above waist level is inefficient. When objects must be carried in front of the body above the level of the waist, lean backward to balance the load and avoid arching the back. When working above head level, get on a stool or ladder to avoid tipping the head backward. Always work at eye level; for example, computer monitors should not be too high or low. To avoid back and neck strain, climb a ladder or stand on a stool so you don’t have to raise your arms over your head. When working with the hands, the workbench or kitchen cabinet should be about 2 to 4 inches below the waist. The office desk should be about 29 to 30 inches high for the average man and about 27 to 29 inches high for the average woman. Tools most often used when working should be the closest to reach. Avoid constant arm extension, whether forward or side-ward. The arms should move either together or in opposite directions. When the conditions allow, use both hands in opposite and symmetrical motions while working. Organize work to save energy. Vary the working position by changing from one task to another before feeling fatigued. When working at a desk, get up and stretch occasionally to relieve tension. Use proper tools and equipment to reduce neck strain, for example, use a paint roller with an extension to reach overhead, thus reducing the need to hold the arms overhead and to hyper-extend the neck. Avoid stooping or unnatural position that cause strain.